Properties in Umkirch average 4.5 out of 5 stars. Property 18: Modern holiday apartment, perfect for the city and enjoy nature! 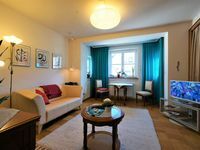 Property 34: Pretty 2 - room apartment, cable TV, W-Lan, balcony, etc. Fabulous Location, Riverside Walk To Old Town, Many Mountain Trails Nearby. Property 44: Fabulous Location, Riverside Walk To Old Town, Many Mountain Trails Nearby.